Jeotgarak translates into chopsticks in Korean and they are pairs of equal, medium-length sticks usually with a flat rectangular shape. 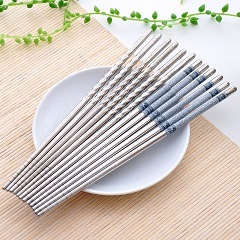 Many Korean metal chopsticks are ornately decorated at the grip and they are used simultaneously with a spoon as the traditional utensils while eating Korean food. Originated from ancient China, chopsticks are now used daily in many East Asian countries such as Korea, Japan, Indonesia, Vietnam, Nepal, and Tibet. They are smoothed and frequently tapered, commonly made from bamboo, plastic, wood, or stainless steel. It is held with the dominant hand, between the thumb and fingers, and used to pick up pieces of banchan as well as rice. To use chopsticks, the lower chopstick is stationary, and rests at the base of the thumb, and between the ring finger and middle finger. The second chopstick is held like a pencil, using the tips of the thumb, index finger, and middle finger, it is moved while eating to pull food into the grasp of the chopsticks. In a Korean table setting, jeotgarak is rested on the right side of one's rice bowl when it's not in use.